Hey CDD fans! 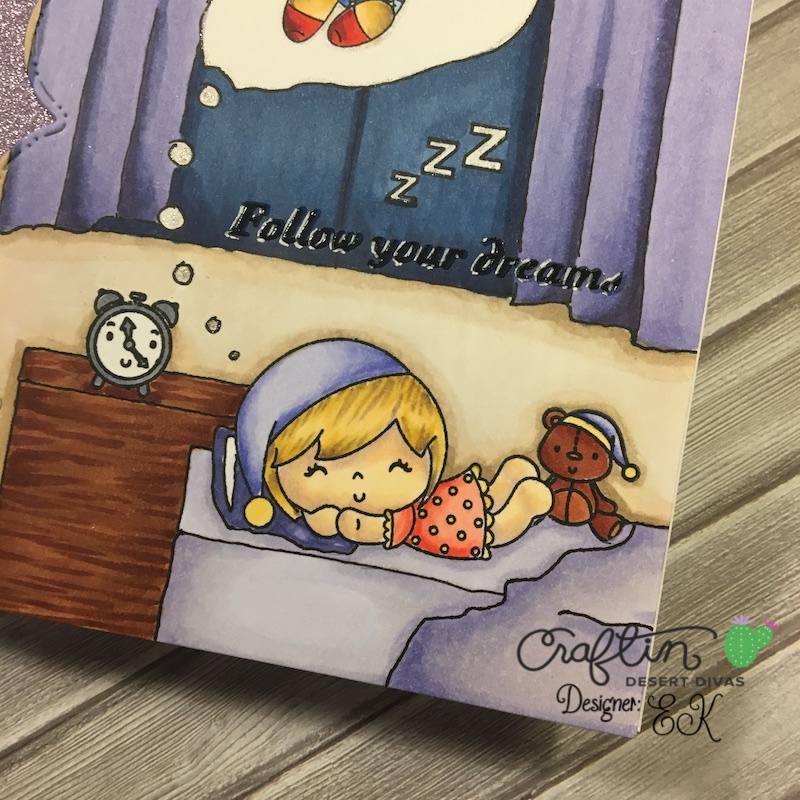 Design Team member EK, from ekgorman designs, back on the blog today to share a pictorial tutorial featuring two great Craftin Desert Divas stamp sets. I hear all the time people say that scene building is just too hard, and I want to show everyone that it really isn't. I just takes a little bit of creativity. 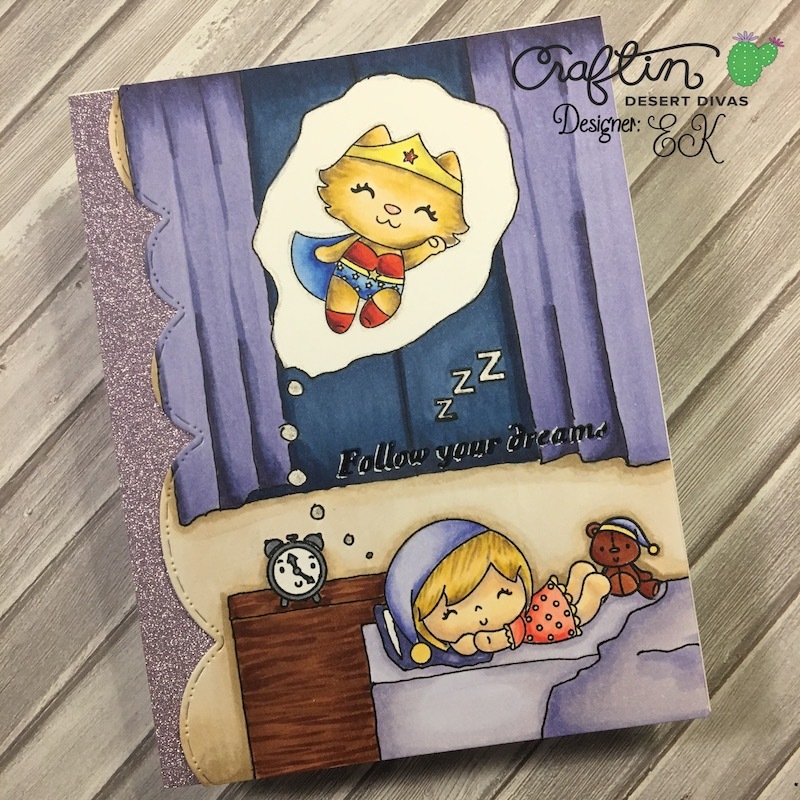 Today, I pulled out the stamp set Dreamland, and stamped out the sleeping girl, the ZZZs, the clock, the teddy bear, and the sentiment, masking where I needed to. Then I had to find an image to be the dream our little dreamer needs to follow. I went to my 7 year old for advice, and asked her opinion. She very quickly answered a 'super hero', and I figured that was simple enough. 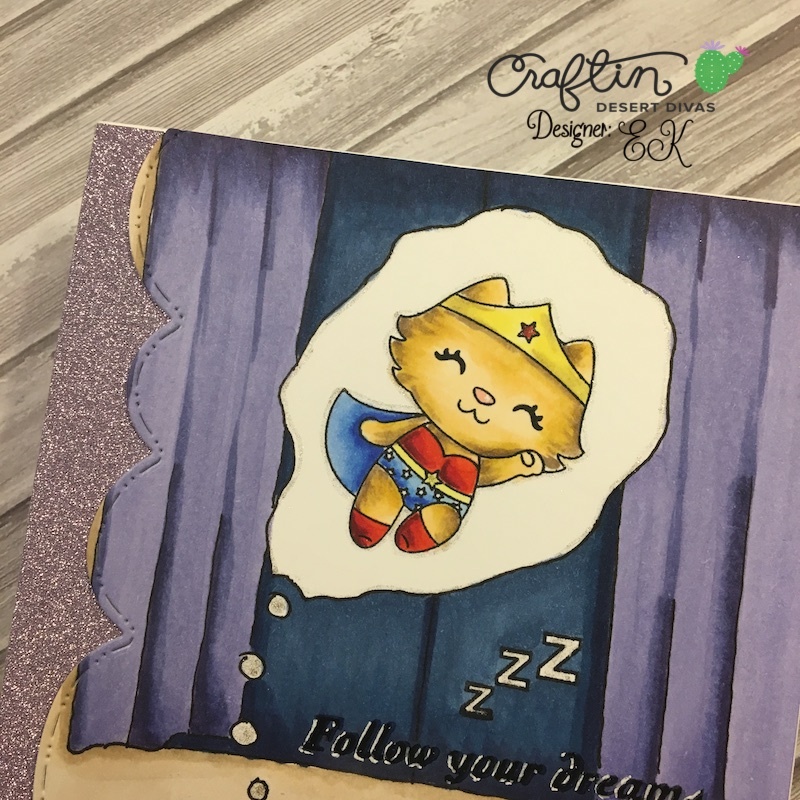 So I pulled out the 'wonder-kitty' image from CDD's Cape Crusaders stamp set and stamped it out in the middle of the card. Then I moved onto the scene. I pulled out a pencil and sketched in a bed with pillow and sheets, a nightstand, and a window with curtains. I also sketched out the little dreamer's dream bubble. Then, using a copic friendly marker, I outlined my sketched and erased any visible pencils lines (once you lay down the marker, you will not be able to erase any offending lines). See how simple building the scene was...and yes I used a ruler to make straight lines. Now for the coloring. I snapped a picture after each section so you can see what I did to color the scene. I like to do the background first, and then add color to my focal images so that I make sure they are what stands out in the end. [gallery ids="18464,18465,18466" type="square"] I started with the dresser, using E23, E25 and E29. The night sky through the window got the colors B34, B37, and B39. Yes, I sort of lost the sentiment, but in the end, I pulled it back to the forefront of the card. The bottom sheet were colored with B60, V20, and BV01. [gallery ids="18467,18468,18469" type="square"] I went a little darker with the top sheet, using V20, BV01, and BV02. The curtains were colored with BV02, BV04, and BV08. I payed very close attention to the folds of the curtains to give them depth. I wanted the walls to look like night, without making the card dark, so I colored them in with E40, E41, and E43. I may have forgotten the pillow on the first pass, so I added some BV02 and BV04 to it. [gallery ids="18471,18472" type="rectangular"] With the background it was time to focus on the main images. I wanted our dreamer to reflect the same colors as Wonder-kitty, so I tried to match the colors up, making the dreamer's cloths a softer version of Wonder-kitty's. Wonder-kitty's reds were colored with R05, R37, and R89. The dreamer's were colored with R20, R22, and R24. [gallery ids="18473,18474" type="rectangular"] The blues in Wonder-kitty's cloths were colored with B21, B24, and B28. The dreamer's (which I think ended up a little too purple) and the teddy bears night caps were colored with B60, B63, and B66. [gallery ids="18476,18475" type="rectangular"] The yellows in Wonder-kitty's crown and belt were colored with Y13 and Y28. The dreamer's clothing accents were colored with YR31. [gallery ids="18477,18478,18479" type="square"] The outside of the clock was colored in with C5 and the face was colored with C00. Our dreamer's skin was colored in with E50, BV000, and E21. The teddy bear was colored in with E15, E17, and E19. I wanted the hair of our dreamer and the fur of Wonder-kitty to match, so I colored both in with a blonde hair combination, using E50, YR21, Y26, and E44. The tip of our super hero's nose got a touch of R20. 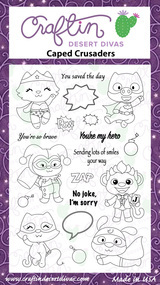 I snagged by favorite white gel pen, the Gelly Roll White Pen, and added a highlight to the tip of the kitty's nose, and to the letters in the sentiment to help bring it back to the forefront of the card. I also added some sparkle to the edges of the dream bubble and the ZZZs with the Stardust Gelly Roll Pen. The sentiment was still disappearing to me, so I re-stamped the image with embossing ink, and heat embossed a clear embossing powder over it. I think that really helped pop the sentiment into focus. Finally, I pulled out CDD's Stitched Scalloped Dies, and die cut off the edge of the card with the the medium scalloped die. I added some lavender glittery paper under the card where it was die cut and adhered the whole project to a top folding A2 card with some 1/4 Scor Tape. Hope you learned how easy building a fun scene around your favorite stamps can be! What an adorable scene..I loved the coloring a lot !